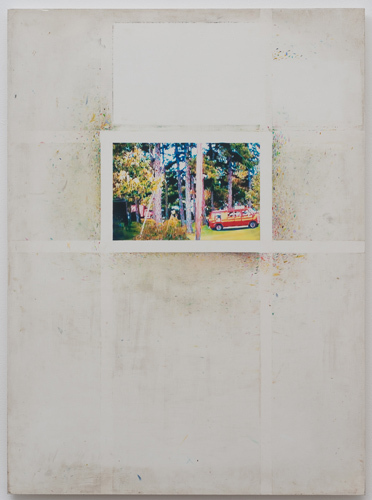 Ed Johnson, Vans, 2009, oil and gesso on Plexiglas, 28 x 36”. Ed Johnson uses oil paint to meticulously render fuzzy photographs taken from freeze frames of videos, an ostensibly cumbersome method that results in a fluid mix of the real and the manipulated. A previous body of work was derived from late-night cowboy movies, but all of the five canvases in this exhibition are based on videos the Los Angeles–based artist took in and around his hometown of Charlotte, North Carolina. These new pieces constitute a nuanced body of work in which ordinary subject matter—a van, bench, or garden sculpture amid foliage—is just recognizable enough to engender a familiarity that is quickly challenged, even eclipsed, by tantalizingly uncertain representation. All of the works are painted on Plexiglas in vivid, hallucinogenic color. In three of the five, relics of the painting process figure prominently. A particularly affecting example of this is Vans, 2009, in which the central image is surrounded by a ghostly rectangle of white bands (left after the artist removed tape from around the painted image) emanating a halo of tiny marks, like exploding confetti, that remain from wiping bits of color from brushes. Though elegantly contrived, these sundry remnants seem almost mannered when compared with the single shimmering image of Devil Among the Tailors, 2011, which dispenses with any direct reference to process. It is the largest painting (as well as the show’s title work) and the only piece that enlarges the scale of the source image. An affable scene—a pink park bench among yellow and blue trees—is discernible through an aqueous painterly surface; the result is a comfortingly familiar image rendered in a surprisingly new way via a centuries-old practice, which spirals from what seems to be a nose-to-the-grindstone quest to find content (and context) for realist oil painting in the twenty-first century to a novel and exciting work.